My grandmother, Marga, taught me to make this dish when I was still at school. I can’t fail to make it now without thinking of her. It’s a very versatile recipe, and can be served with all kinds of sides. I’ve served this chicken with crusty bread and a glass of wine. I’ve chucked a tin of white beans and a couple of cups of sliced mushrooms into the pot an hour before the cooking was finished and made it into a one-pot meal. I’ve served it with a big fresh salad and cobs of corn. I’ve served it on a bed of rice, and also on a bed of pasta. I’ve served it with mashed potatoes and steamed vegetables, or a big pan of all manner of roasted vegetables. 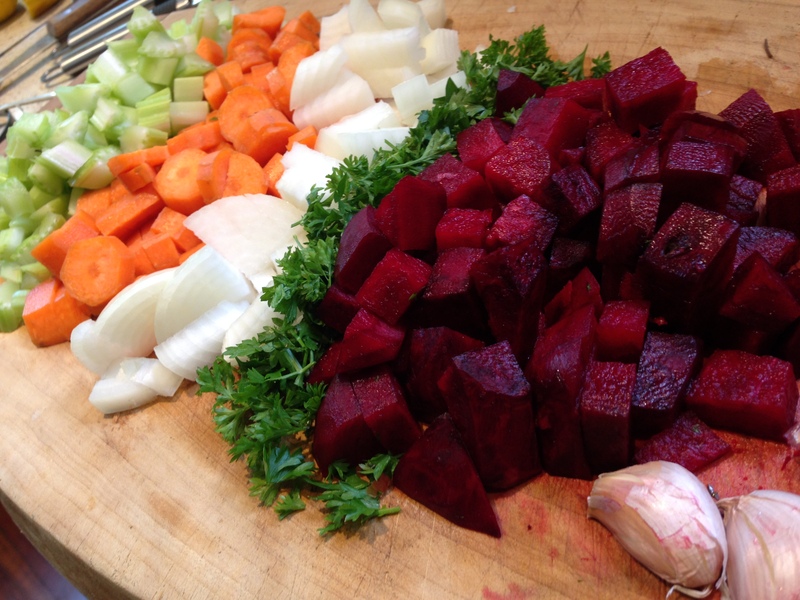 Work with what’s seasonal and fresh in your area right now, and what you and your family love. That way you can’t go wrong. Do try and make this with chicken pieces that have bones. The flavour will be more robust and the longer cooking and the acid from the tomatoes will help leach all the fat-soluble minerals from the bones, as well as amino acids and the collagen and other nutrients from the meat, cartilage and tendons. 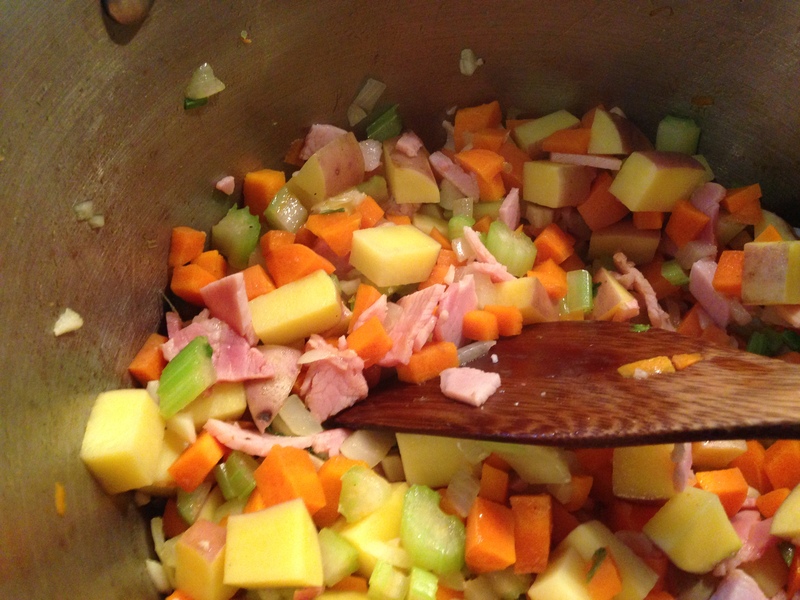 The recipe can also be easily halved, if you prefer. Here’s last night’s leftovers, all set to go into the fridge. The photo below reminds me of so much of Marga, a fabulous cook who was always putting leftovers into re-purposed ice-cream or butter containers, ready to begin the makings of another meal. I’ll pull all the meat off the bones tomorrow, and put it back into the sauce. Then it can be used as a ragu over pasta or vegetables, or even served warm for breakfast with a runny poached egg and a handful of fresh herbs on top. Separate the garlic cloves, crush lightly with the flat of a knife and remove the skins. Cut into halves or thirds. Chop the onion into a rough dice. 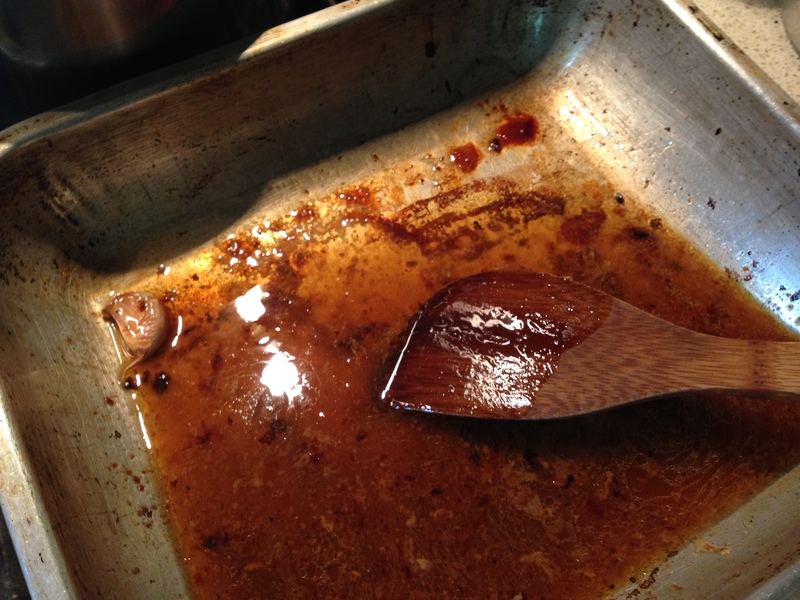 Heat a slug of oil in the bottom of a very large skillet or high-sided frying pan on medium to high heat. Brown the chicken in batches. The chicken doesn’t need to be cooked through. You simply need to brown the skin and outer flesh. Place chicken to one side. Pop the garlic and onion into the pan and reduce heat. Stir until soft and fragrant and then add in the olives and the oregano. Stir some more. 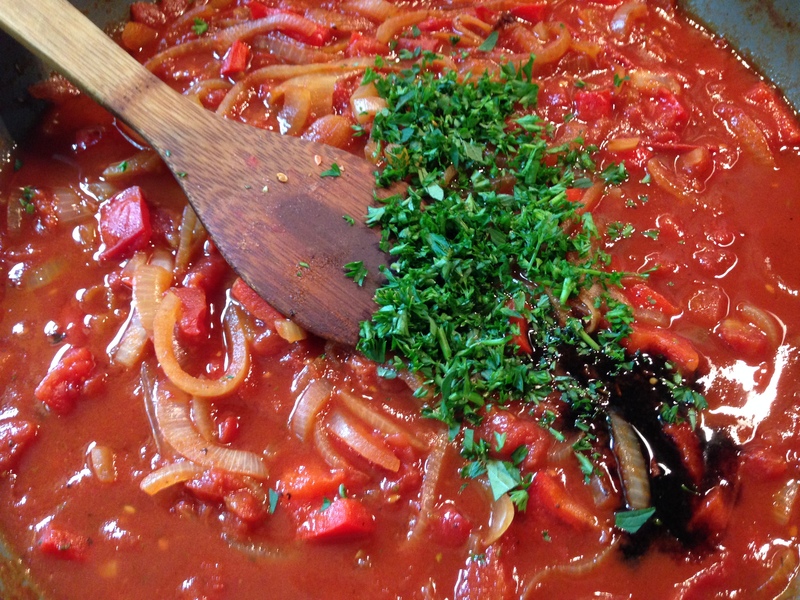 Now dump in one teaspoon of the grated lemon zest, the tomatoes and the tomato paste. Give a good grind of pepper and a sprinkle of salt and stir well. Add the chicken pieces back in, making sure that they are well covered with sauce. Add a lid and cook over low slow heat for four hours, turning occasionally. This can also be cooked successfully in a slow cooker for the same length of time. Just before serving taste the sauce. Add in the extra teaspoon of lemon zest to freshen up the flavour and adjust salt and pepper if needed. 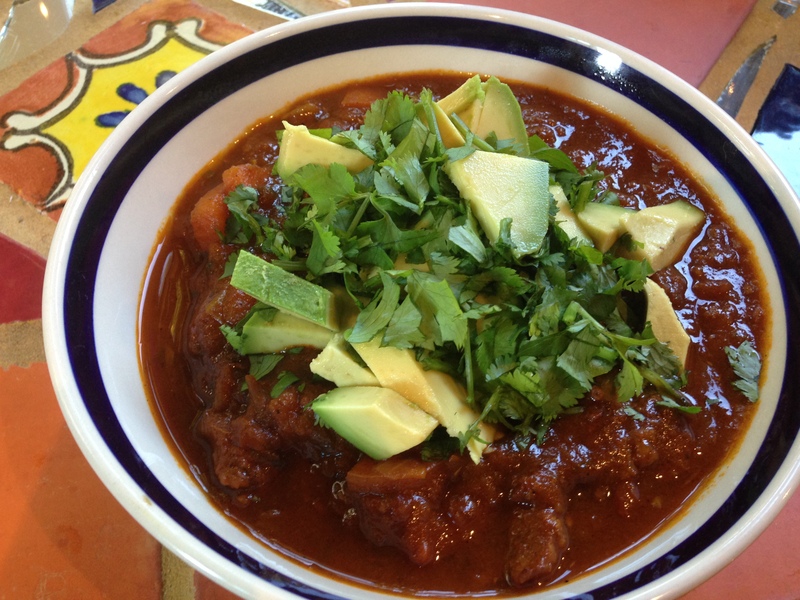 Chilli con carne is one of those great comfort food dishes. 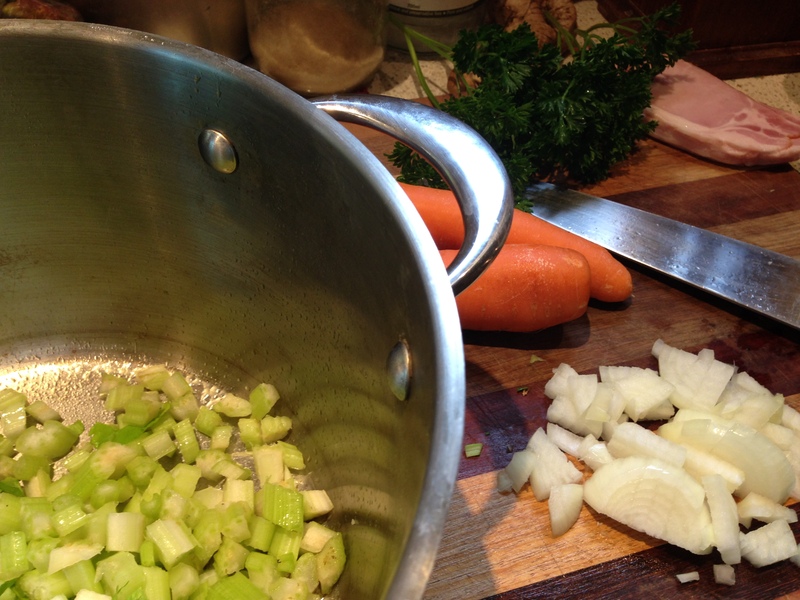 I usually make a big pot, and it does us for two or three meals, depending on how many mouths I am feeding. It can be made in a slow cooker, it freezes well, and left-over mince can be used as a nachos topping, in burritos, on toast or in jaffles. Want to pad it out a bit more? Add in another can of tomatoes and a drained can of tinned corn. Chuck in some vegetables if you want. 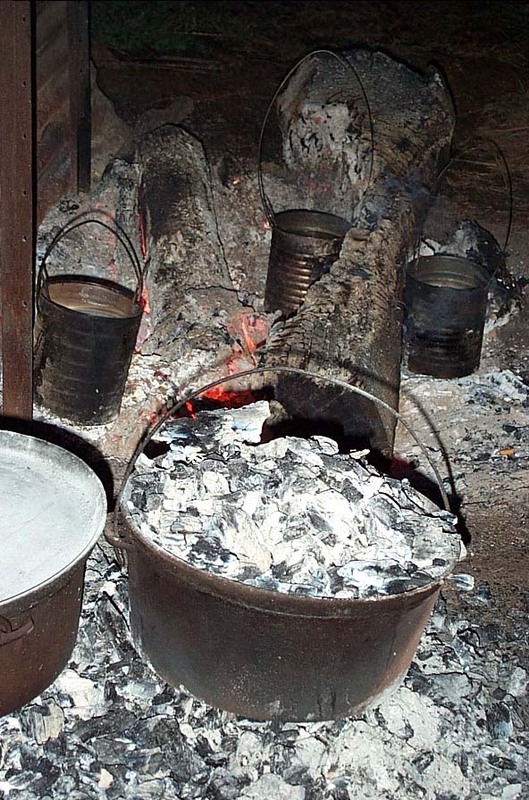 That’s the joy of country cooking. You work with what you have to hand. 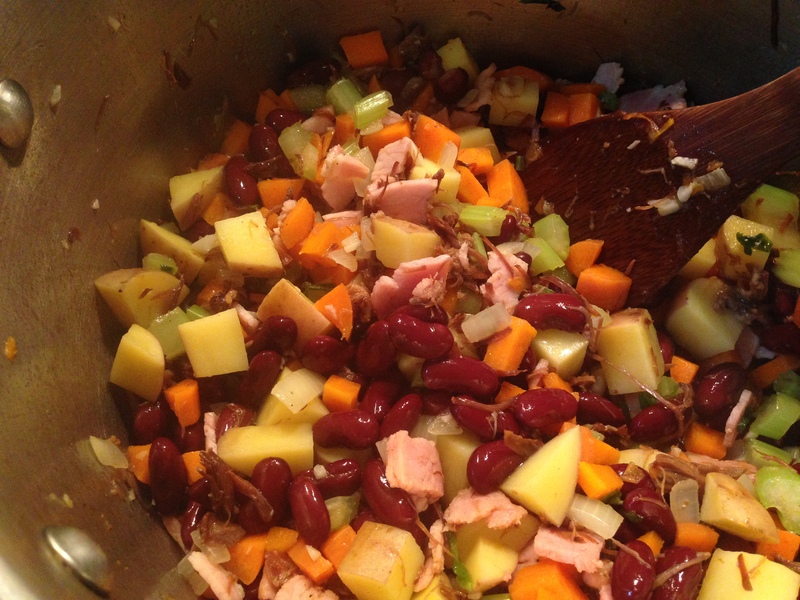 I will often add a second can of tomatoes and some extra beans into whatever is left-over after our first meal to make another big pot if I need to. It’s also easy to adjust the seasoning to suit your family’s taste. Like it hot? Add more chilli. Less hot? Just add a touch, or leave it out altogether. 1 large onion, 1 large red capsicum (bell pepper), 4 garlic cloves – peeled and crushed or chopped finely, 500g of lean beef mince, 2 rashers of bacon chopped in small dice, 1 tablespoon olive oil, 1 tspn smoked paprika, 2 tspns cumin, 1 tspn dried oregano, 1 400g tin of diced tomatoes, 2 tablespoons of tomato paste, 1 400g tin of red kidney beans – drained, 1 heaped teaspoon of beef stock powder or one large stock cube, 1 tablespoon of dark chocolate (about four squares) salt and pepper to taste, 1 long red chili (or your favourite chilli paste, powder or sauce), fresh coriander (cilantro), lime wedges and cooked rice to serve. Dice the onion and capsicum. Add to a large saucepan with the oil over medium heat. Stir until the onion is soft and slightly translucent. Add spices and garlic and keep stirring. Chuck in the diced bacon. Stir well to prevent sticking and add another slug of oil if necessary. When the mixture is warmed, fragrant and the bacon is slightly browned add in the mince. Brown mince well. 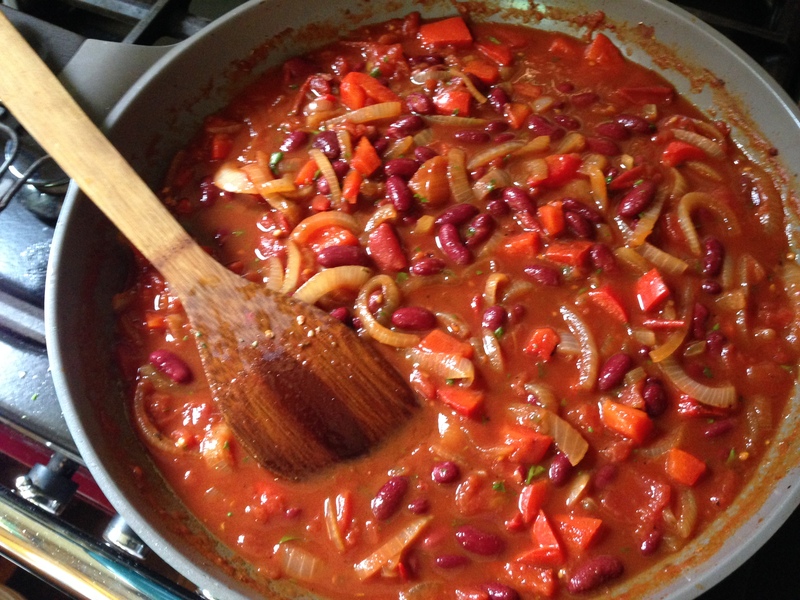 Now throw in the tinned tomatoes, tomato paste, drained kidney beans, beef stock, salt and pepper and mix well. Taste and adjust chilli if necessary. Add the dark chocolate. Trust me – it adds real depth of flavour. Don’t go crazy. You want to adjust the sweetness without making it taste noticeably of chocolate! Turn down heat and simmer for a minimum of thirty minutes. Serve on a bed of rice with fresh chopped coriander sprinkled over the top and a wedge of fresh lime. Additional accompaniments include salsa, grated cheese, guacamole, sour cream or yoghurt, and corn chips. It’s cold, blustery weather here at the farm right now. I made a pot of this simple curry with the meat from some leftover grilled lamb chops. This recipe works equally well with leftover lamb from your weekend roast or barbeque, or with fresh meat. This curry has loads of turmeric, bone broth, garlic and other healing foods – super for nourishing your body and boosting your immune system. And the Moroccan-style spices give a rich, slighty sweet flavour. It was so easy to throw together that I didn’t think to take any pictures until it was ready to be eaten. But don’t panic – it’s very straight forward. 500 grams lean diced lamb (cooked or uncooked), 1 large onion, 1 tablespoon of ghee or oil, 1 x 400 gram tin of diced tomatoes, 2 cloves of garlic – crushed, 1 cup of diced raw carrot, 1 cup of diced sweet potato, 1 seeded and chopped red capsicum (bell pepper), 2 cups of good quality chicken or vegetable stock, 4 to 6 dried dates – chopped, 2 teaspoons of dried turmeric, 6 green cardamom pods – lightly crushed, 1 bunch of coriander (cilantro/chinese parsley) – halved and finely chopped, 1/2 teaspoon powdered ginger, 1/2 teaspoon cinnamon, 1 teaspoon cumin, avocado to serve. 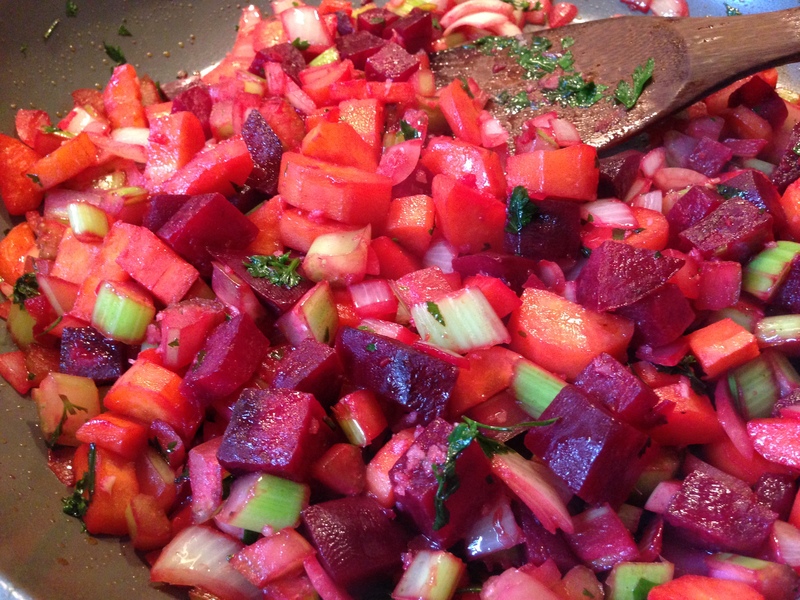 Place the oil or ghee, the diced meat and onion in a large heavy bottom saucepan and cook over medium heat until the meat is browned (if raw) or until the onions are lightly coloured. Add in all the dried spices and garlic and cook for another few minutes, stirring well, until fragrant. Now add half the coriander and the final ingredients. 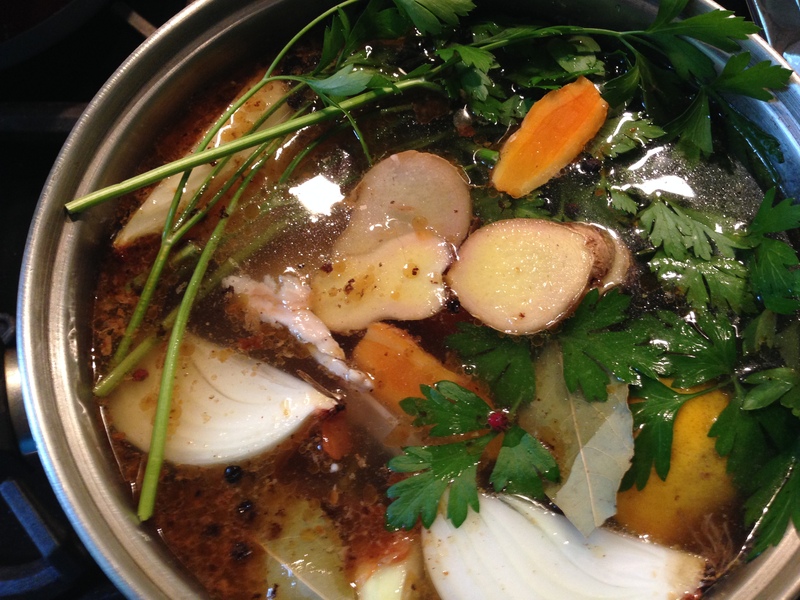 Stir well to combine, and then lower the temperature, place a lid on the pot and simmer for a minimum of one hour. I cooked mine for three, which helps the flavours to soften and combine, and makes the meat falling-apart-soft and easy to digest. 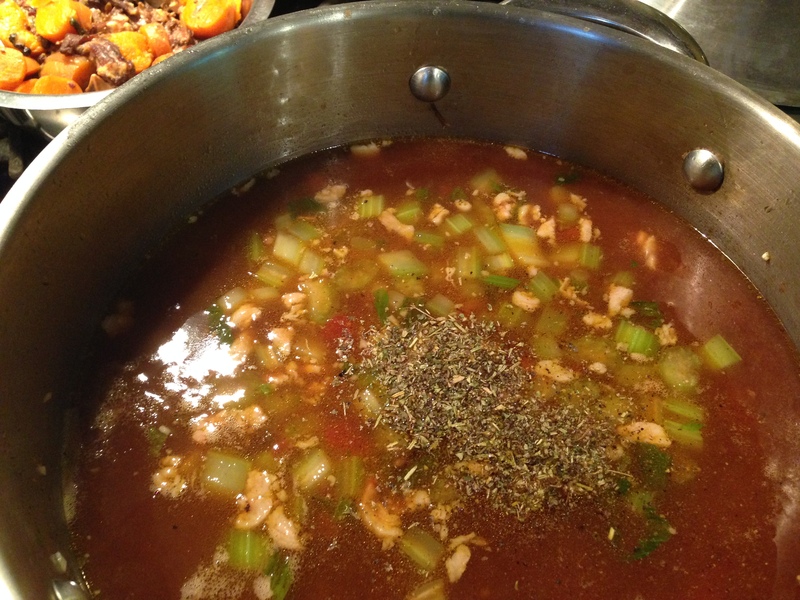 Check occasionally if simmering on a cooktop, and moisten with a little extra water if needed. 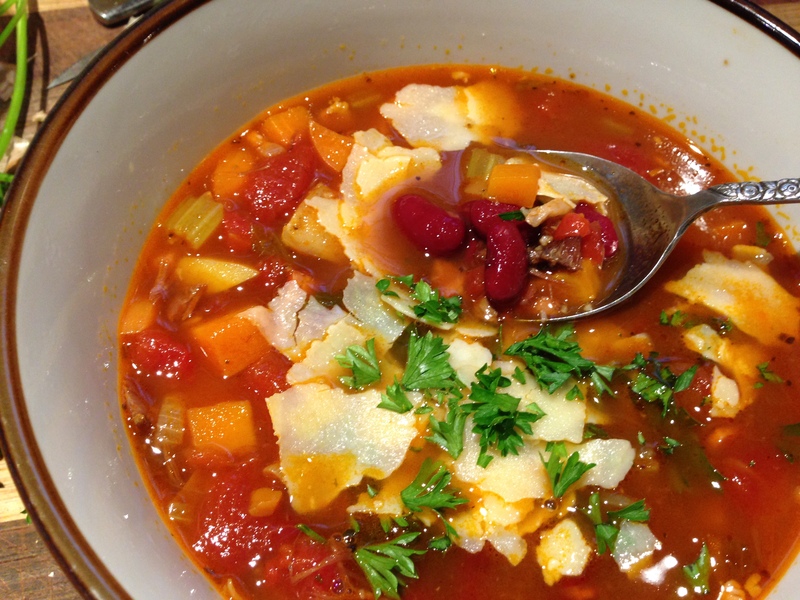 If you like, this can also be cooked easily in a slow cooker, and shouldn’t require extra liquid. To serve, top with the remaining chopped coriander and some diced avocado. You can enjoy the curry as a paleo dish on its own, or serve it over rice, steamed vegetables or with some good crusty bread. Leftovers can be refrigerated for up to three days and are also good in jaffles, on toast, or thinned with some extra diced tomatoes as an easy pasta sauce. It also freezes well. I am not always up to cooking just now, so when I am I like to cook enough food to guarantee us some easy-to-reheat leftovers or freezer meals. 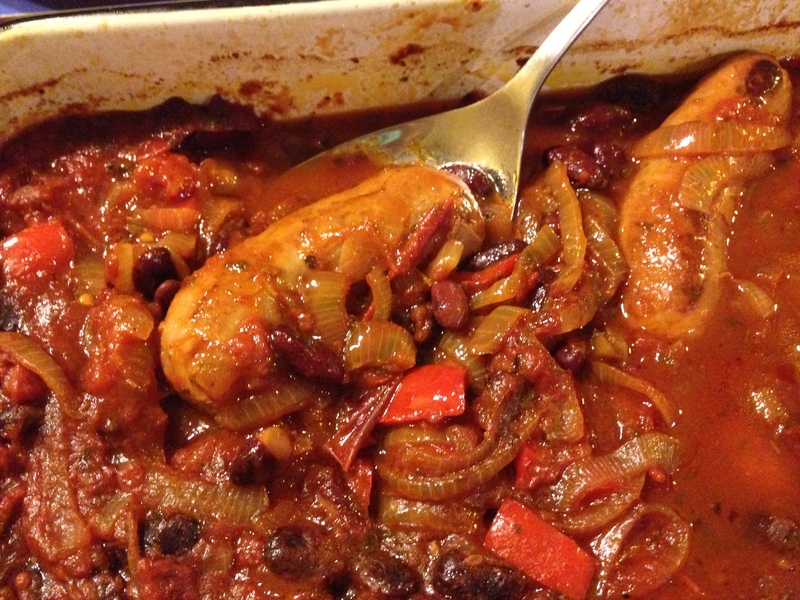 Note: This dish can easily be made vegan or vegetarian by using vegan sausages and vegetable stock. 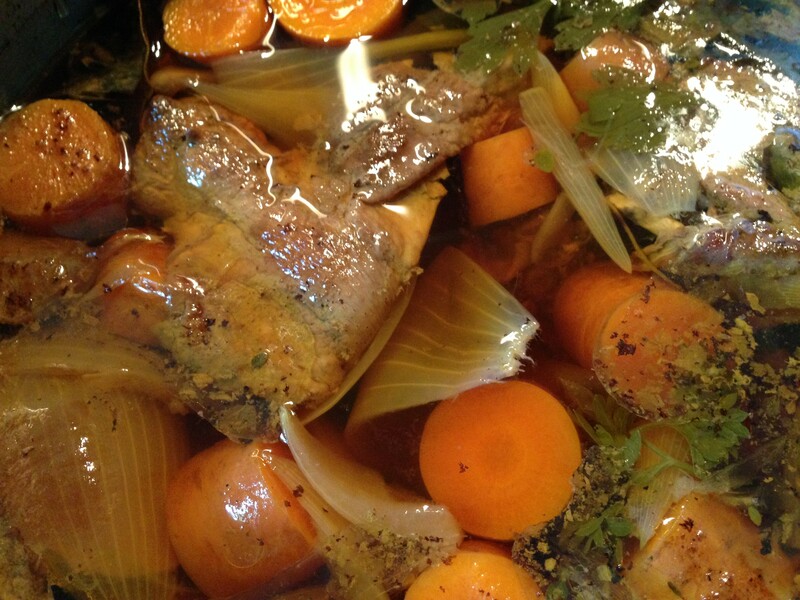 Sunday is usually my day for cooking stocks and soups, and slow cooked foods that use up anything in the fridge or pantry that needs eating. I’ve used fresh tomatoes here as well as canned ones, because I had a few tomatoes going a little wrinkly on my kitchen bench. 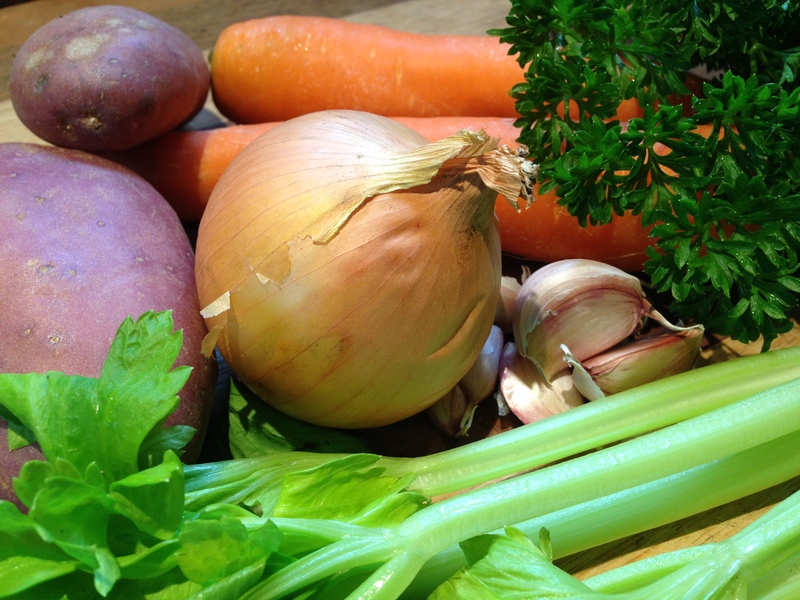 Feel free to experiment with this recipe to use up those older vegetables. It’s a forgiving dish, and is open to inclusion of many extras. 1 kilogram fat beef sausages (or sausages of your choice), 2 large onions sliced, 1 red capsicum (bell pepper) diced, 1 cup of diced fresh tomatoes and one 415 gram tin of diced tomatoes OR two tins of diced tomatoes, 2 tablespoons of tomato paste, 1 tablespoon of olive oil or butter, 1 teaspoon of chicken stock powder (or equivalent) and one cup of boiling water OR one cup of good bone broth or stock of your choice, 1 tablespoon of balsamic vinegar, 1/2 teaspoon of sugar, 1/2 cup of red or white wine, one tablespoon of fresh herbs (I used parsley and oregano) or one teaspoon of dried Italian or Mixed Herbs, 1 tin of red kidney beans, water, salt and pepper. Optional: a fresh sliced chilli or a slug of Tabasco sauce if you like a little heat in your food. 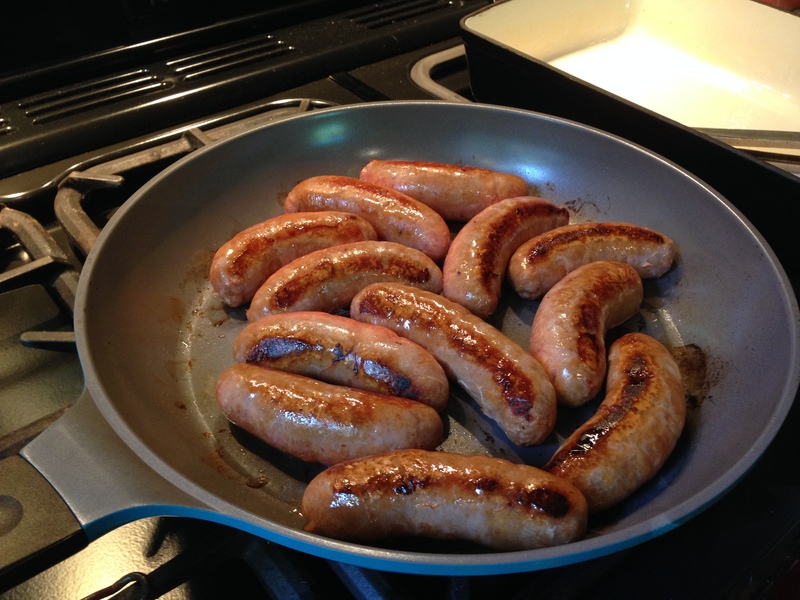 Fry up your sausages over medium heat, using the tablespoon of oil to prevent them sticking. No need to cook them through. Just seal them and give them some colour. 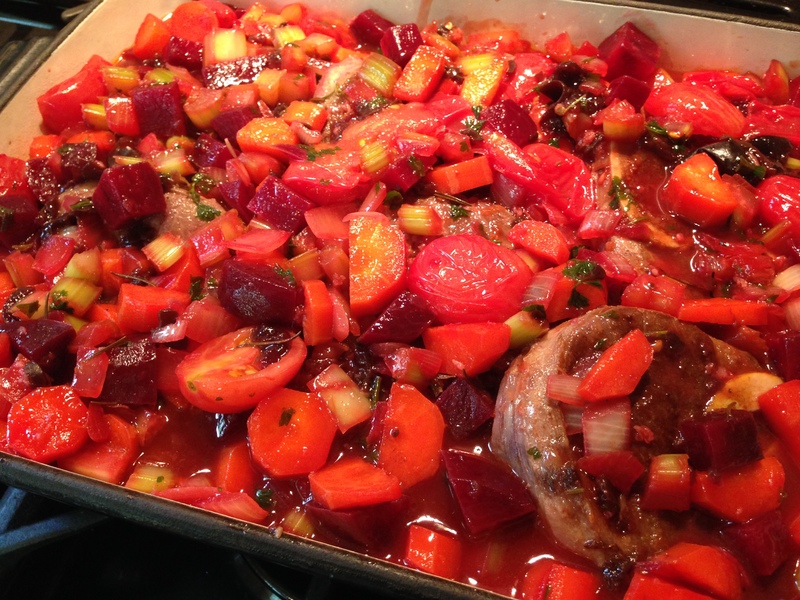 Then remove them from the pan and place into a large baking dish, casserole or slow cooker. Leave any fat in the pan. Now add the onions and capsicum, and fresh tomato if you are using it. 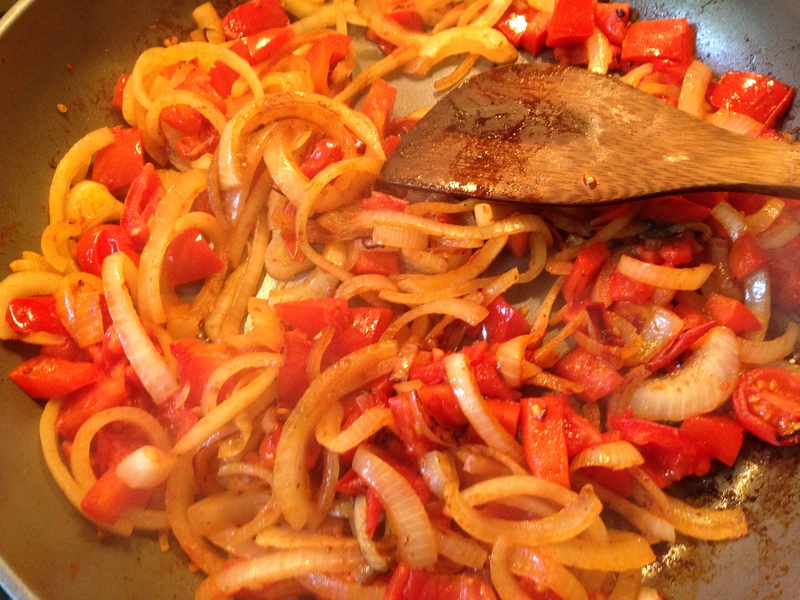 Fry gently for three minutes, allowing the onions to become golden and the capsicum and tomatoes to soften. 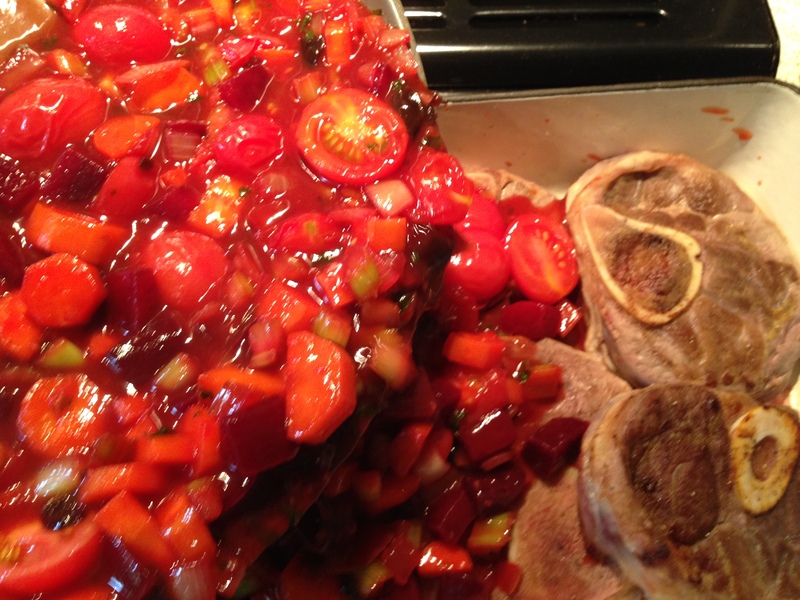 Add the stock, wine, tomato paste, tinned tomatoes, fresh or dried herbs, sugar and vinegar. Stir well. 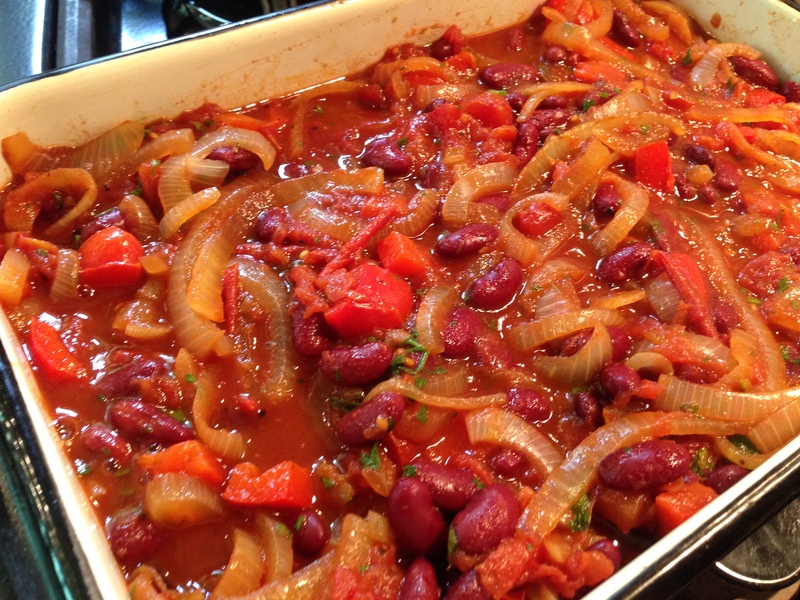 Drain and rinse the kidney beans and add those too. Let this simmer for a few minutes. Then taste and season with salt and pepper. Pop in the fresh chilli or Tabasco if you are using it. 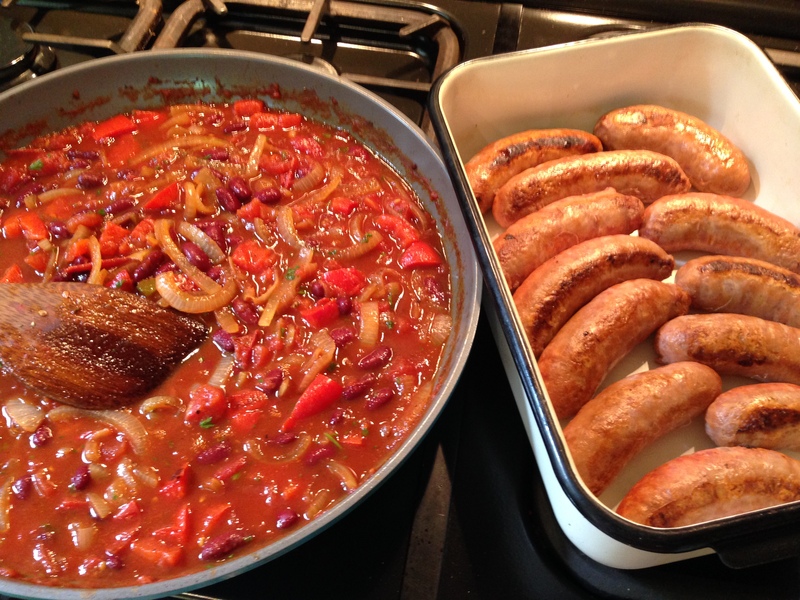 Pour sauce over the sausages in your baking dish or slow cooker. Cover with a lid or some foil to prevent burning or drying out. Cook in a moderate oven (180 degrees celsius/ 350 degrees fahrenheit) for 30 minutes, and then reduce heat to 150 degrees celsius/ 300 degrees fahrenheit) and cook for 1 hour. 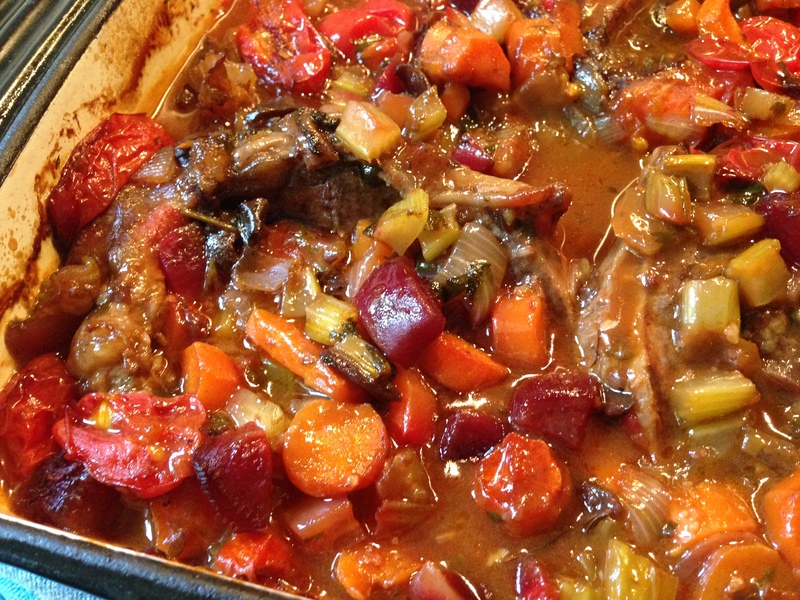 If using a slow cooker cook for three hours on low heat. Serve over pasta, rice or mash. It’s also good with a crunchy salad or fresh seasonal vegetables. 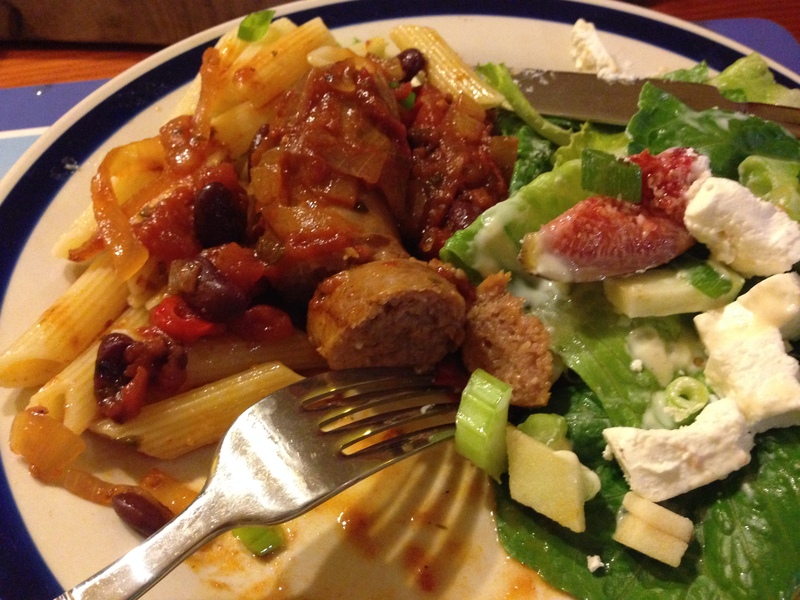 This meal freezes well, and can be reheated in a moderate oven, covered, for thirty minutes. 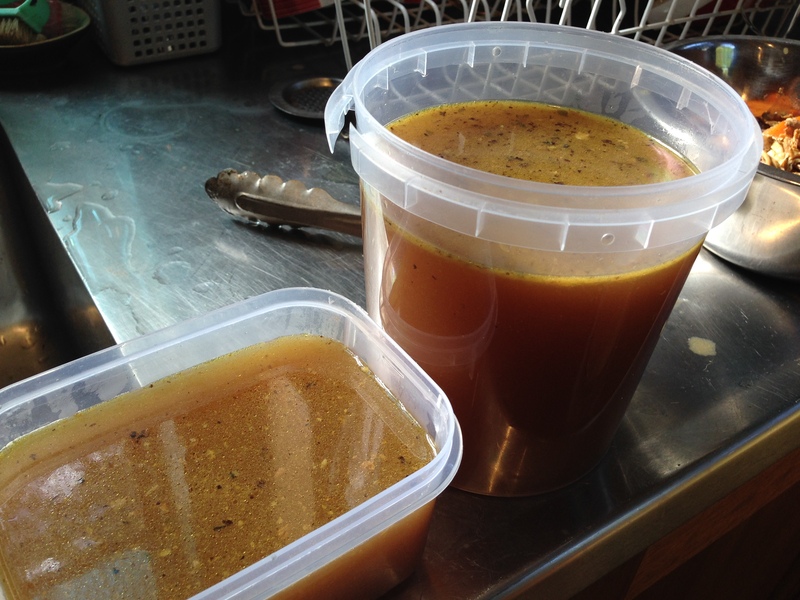 Any leftover gravy is super as a pasta sauce, spooned over chops or with eggs on toast for breakfast. Enjoy! PS – For those of you who enjoy camping, this is FABULOUS to make in a camp oven! 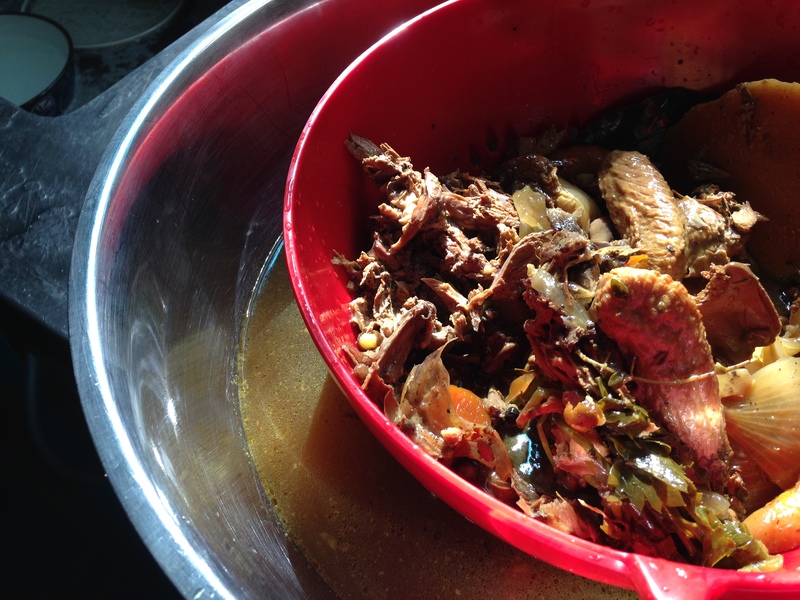 Slow-cooked real food. Is there anything more nourishing, more heart-warming and soul comforting? 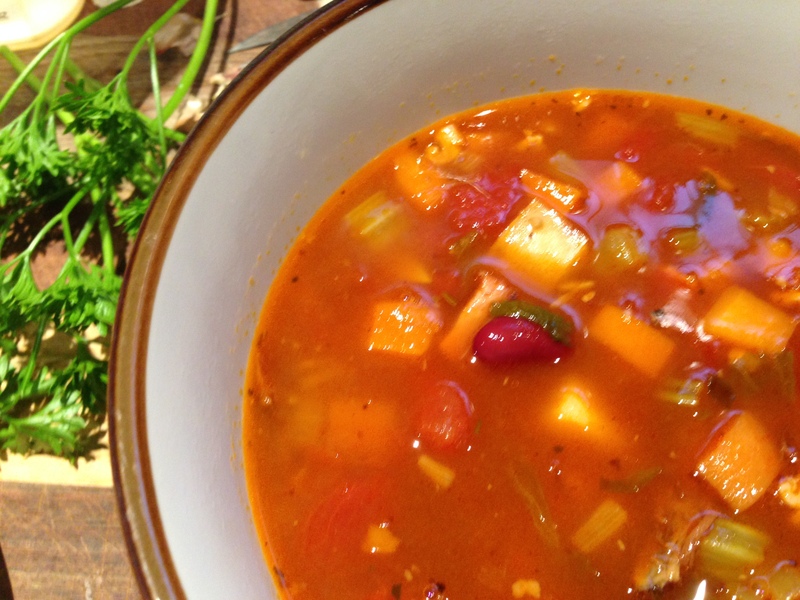 This recipe came about by happy accident, as I was debating what remnant vegetables in the bottom of my crisper drawer would be relegated to the soup pot or the worm farm. A fist-sized beetroot was begging to be used up. The seasons are doing their slow slide from summer to autumn here at the farm. The days are still warm but there’s a chill in the air come late afternoon, and I’m airing the blankets ready to put on the beds now that the nights are cool again. 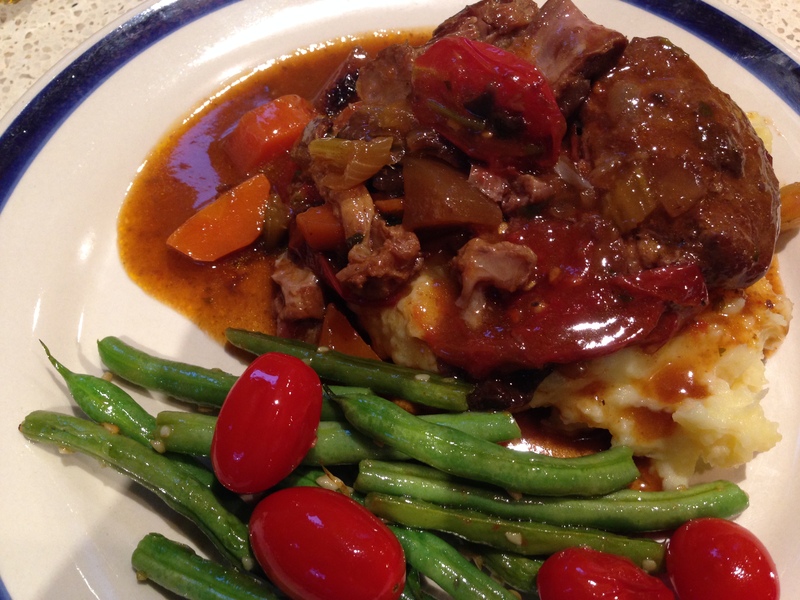 Osso Buco is a cut of meat ; traditionally cross-cut veal shanks that expose the marrow bone. 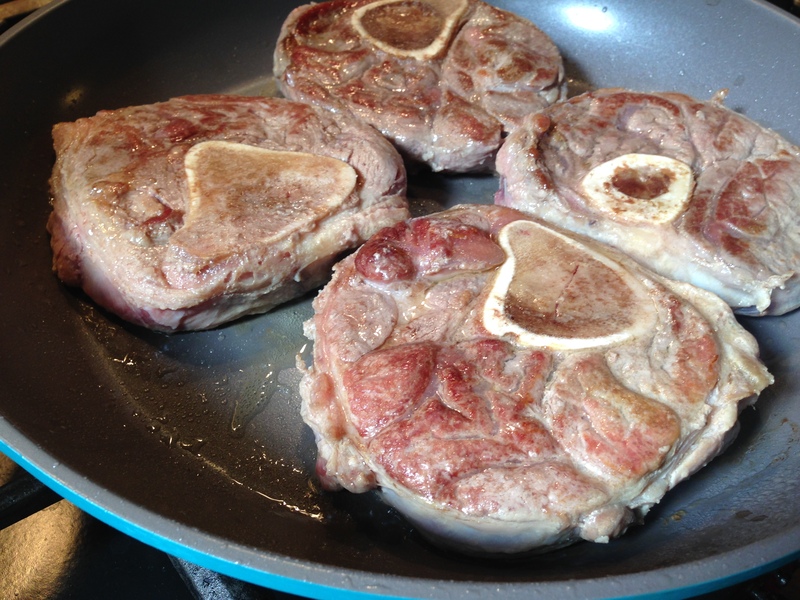 The meat is best cooked slowly, and the bone marrow and cartilage from the osso buco will create a velvety sauce with all the benefits of bone broth. 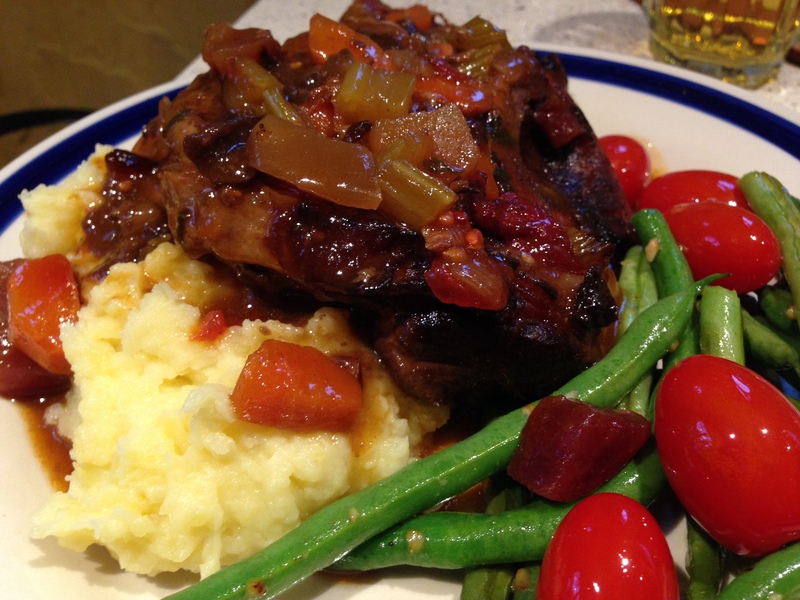 I’ve diverged from my traditional osso buco with a few simple ingredients that bring an earthy rich sweetness to this humble but classic dish. 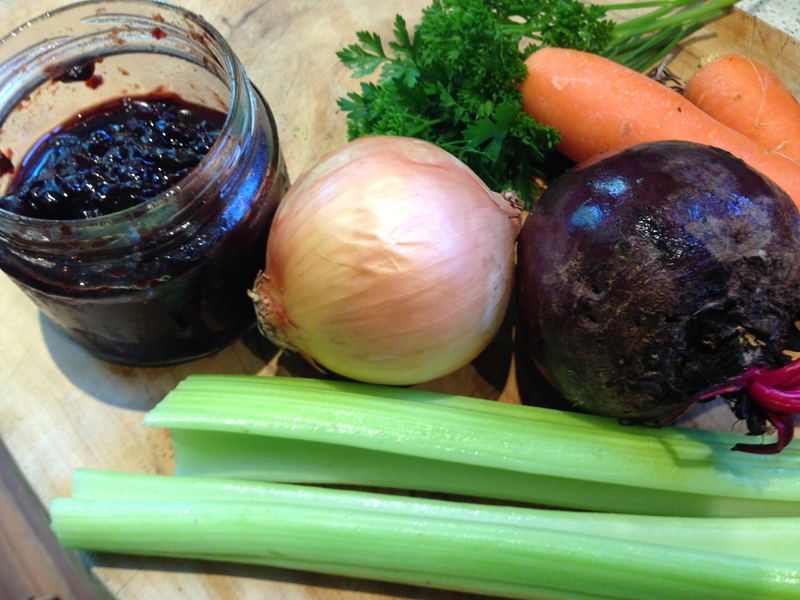 The beetroot really makes this recipe. Preheat oven to moderate (160 degree celcius fan-forced or 180 degree oven – 350 degrees fahrenheit). 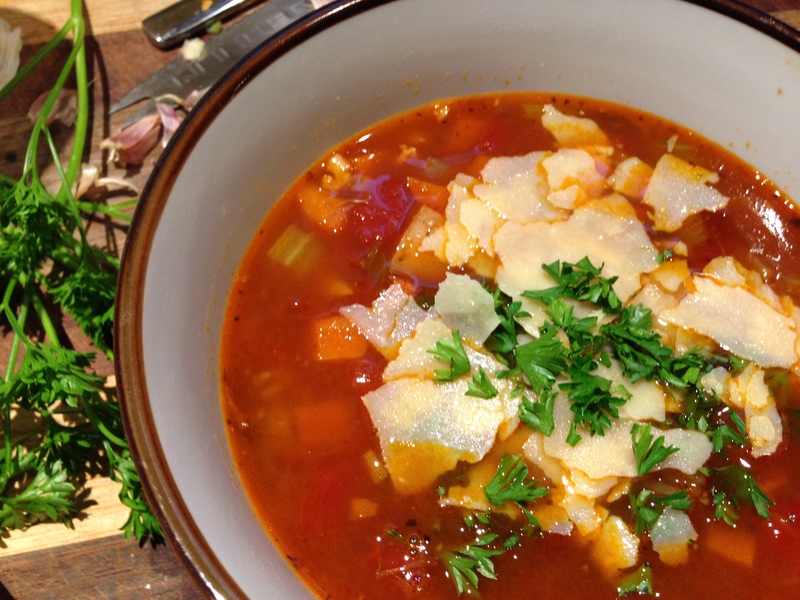 If you’re using a slow cooker, put this on to warm up. Place a tablespoon of oil into a heavy-bottomed pan and bring to a medium heat. Lightly pan fry the meat in batches until brown. Then place the meat into a large baking dish. Don’t wipe the fat out of the frying pan. You’ll be needing it again in a minute. Now chop all of your vegetables and the parsley. Top and tail the beetroot and then peel before cutting. Crush or finely chop your garlic. Keep the tomatoes aside for later. Add the chopped vegetables into the frying pan, and stir over moderate heat for a few minutes until the vegetables soften and brown slightly. The beetroot will stain things pink, but that’s okay. Now add your chopped tomatoes and the rosemary. Stir for another few minutes over medium heat and then pour in the wine. Keep stirring every so often. 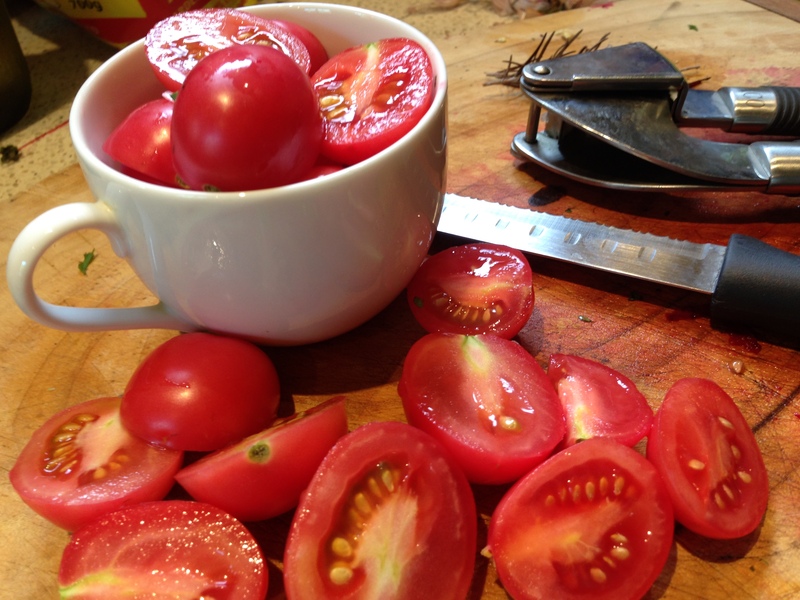 Let the tomatoes soften slightly (if using fresh ones). Finally, take some of the stock and mix in the cornflour until it makes a smooth milky paste. 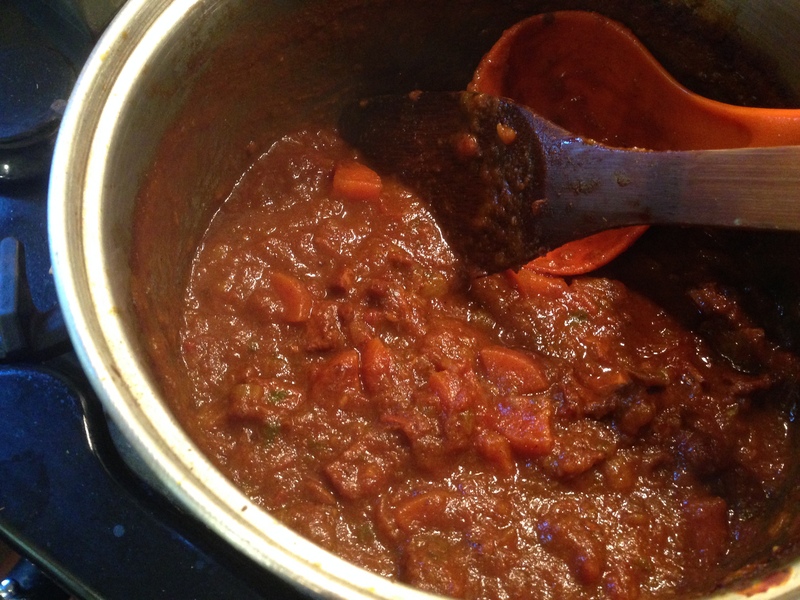 Tip into the pan to thicken your mixture and then add in the tomato paste, stock, and jam. Give this all a good grind of black pepper and a little salt to taste. It should taste GOOD! 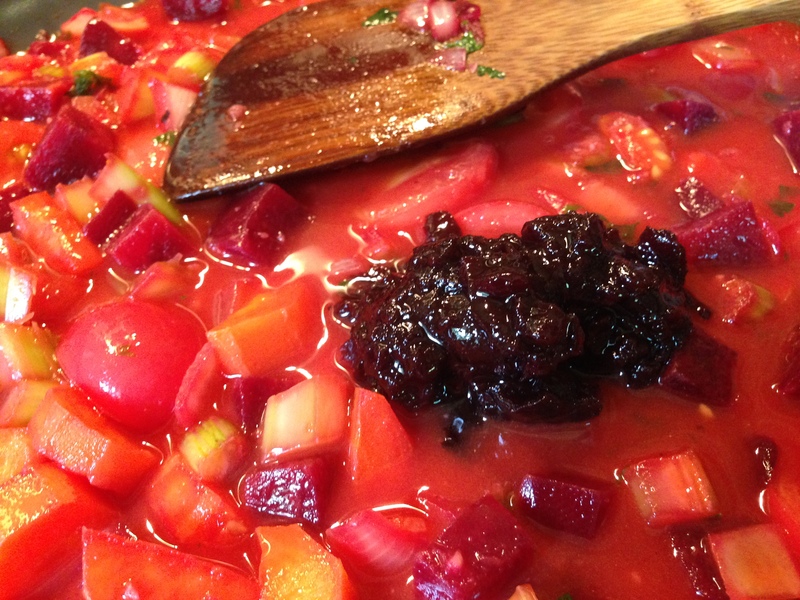 Carefully tip the beetroot mixture over the meat, making sure that everything is well covered. Cover with a lid, or place some baking paper on top, followed by a ‘lid’ of aluminium foil tucked in around the sides. Bake in the oven for 30 minutes, and then turn the heat down to 150 degrees celcius if fanforced (300 degrees fahrenheit) or 160 degrees celcius (320 degrees fahrenheit) if not. Cook for a further 2 hours and thirty minutes. 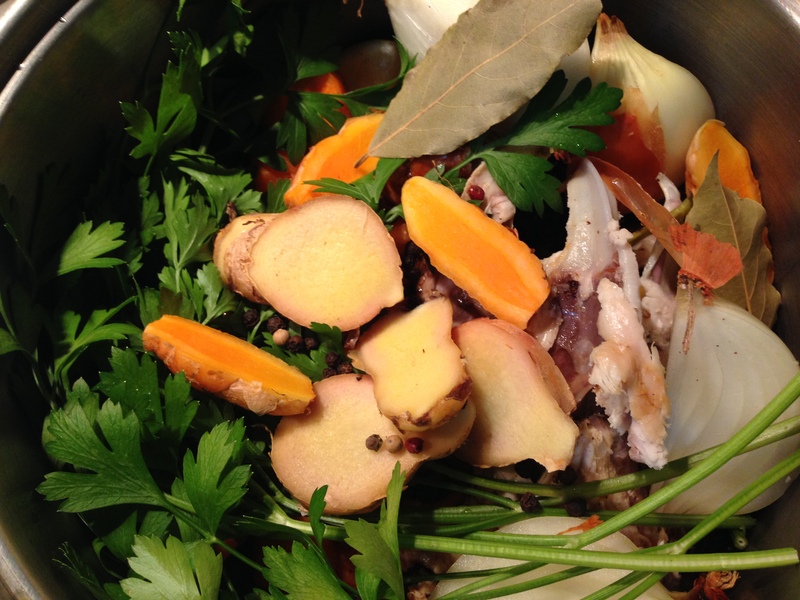 If using a slow cooker, cook for 3 to 5 hours, testing after 3. 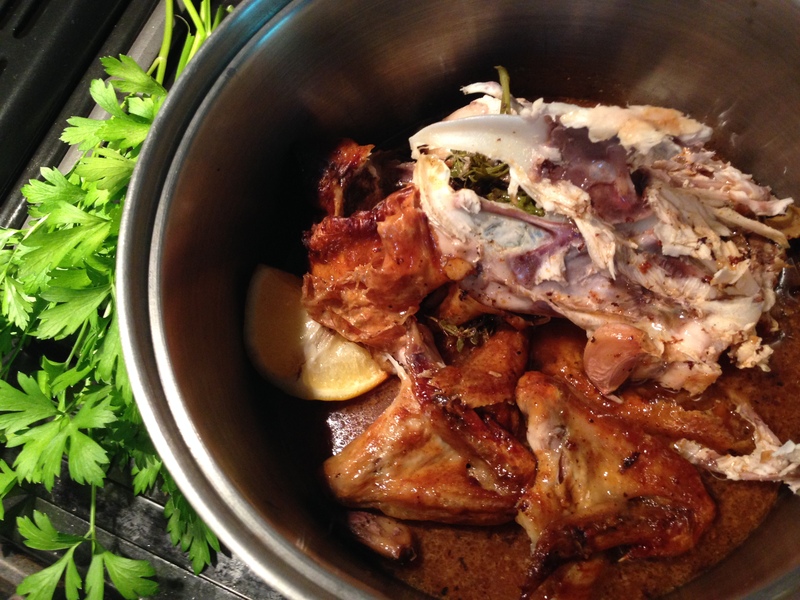 The meat should fall easily off the bone and be soft and silky. Serve on its own, or on a bed of creamy mashed potatoes with some fresh seasonal vegetables. Make sure to ladle plenty of the gravy over the meat. That’s the best bit! As you can see from the picture below I served ours with mashed Nicola potatoes and some pan-fried fresh green beans and sweet cherry tomatoes with a little garlic and olive oil to dress them.